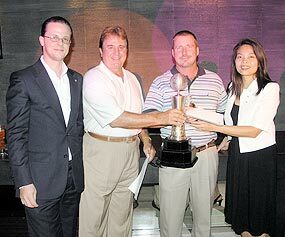 The monthly golf tournament was held at the Green Valley G.C., Mae Rim last week on October 23. For this tournament the golfers played from the Gold Tees, a total of 6875 yards, and due to the overnight rain and the wet conditions the course was playing particularly long. Steve Polaski (2nd right) receives the winner’s trophy. Closest to the pin on the par 3s were in order of holes - #3: Mr Kim, #6: Dennis Dobrick, #12: Steve Polaski and #16: Mat Wisibana. The Long Drive on hole number 5 went to Jeff Crosthwaite. Coming in second place for the day and shooting a net 80 was Mr. Kim. On the front nine he was even par thru 6 holes with just three bogies on the last 3 giving him a halfway total of 39. On the second 9 he shot 41 off the stick for a total of 80. Mr. Kim is a very consistent golfer and does not take big numbers. Well done Mr. Kim! In first place with a 79 off the stick was Steve Polaski. Steve was even par on the front 9 shooting a 36. When he bogied number 4, he then came back to birdie number 7. On the second nine Steve was very consistent shooting a 43, but double bogeying number 18, for a total of 79. Well played Steve! After the tournament the golfers gathered at the Kad Kafe Shangri La for a buffet dinner followed by a celebration and an award ceremony at the Silapa Thai where gifts were presented to all the above winners, and for second place a buffet dinner for 2 going to Mr. Kim. The first prize of a night’s stay at the Deluxe Room goes to Steve Polaski. Yara, Amarin Plaza’s Outdoor Unlimited Zone, The Tourism Authority of Thailand, and Active Management Asia have recently announced the 3rd edition of the popular Bangkok Challenge, The Yara Bangkok Challenge 2008 Adventure Race, which will commence on Saturday November 15, 2008, and will be held in Nong Chok, Bangkok. Yara Bangkok Challenge comprises a multi-discipline event through the backwaters of Bangkok. 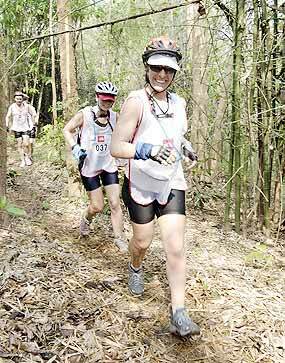 The Yara Bangkok Challenge 2008 Adventure Race is a three to eight hour adventure racing, which will take teams of 2 participants through a 40+ km course of trekking, mountain biking, swimming, and paddling as well as some mystery tests. “It is difficult to believe that we can set up a decent Adventure race course at only one hour driving from the city center,” says Serge Henkens, the Race director. “But after 3 years of existence, this race has become extremely popular for its uniqueness. This course is very different of what we usually propose in Kanchanaburi or Chiang Mai. It is flat here,” says Henkens. The reason Nong Chok has been chosen as the race venue this year is because the area has so much to offer to outdoor enthusiasts. The area comprises of paddy fields, lakes, canals, temples, wooden bridges, buffaloes, birds, all of which can offer participants a memorable experience and a wonderful voyage trough the greenery and beauty of the Thai countryside. There will be 2 separate divisions at this year’s race running different courses: Adventure level is accessible to anyone with a minimum of fitness while Extreme level is best suited to the more experienced and stronger athletes. The race is open to anyone 14 years of age or older and each team must consist of two athletes. The Chiang Mai cricket season got under way with a Twenty/20 round-robin series on the weekend of the 18-19 October with games at both Gymkhana Club and Prem Centre. Three Bangkok teams and two Chiang Mai sides played a series of matches at both venues starting at 10 am and 2 pm each day and some exciting cricket was witnessed. Bangkok was represented by the Siam Parrots, Bang­kok Blues and Southerners with Chiang Puak and Rama­kian flying the flag for the locals. Both Chiang Mai teams included a number of Thai boys who have been introduced to cricket by the coaching programs over the past years. B. Blues 6/151 (Abinder Singh 65) def: Southerners 7/139 (B. Trigger 33). B. Blues 7/185 (Shayan Singh 46) def: Parrots 119 (Jackson 4/30). Ramakian 4/159 (Makki Assadi 61) def: Southerners 9/93 (R. Oster 41, Asif Khashoo 2/22). Ramakian 3/81 (Chai 39 no.) def: Parrots 5/60 (S. Potter 2/2). B. Blues 4/188 (Abinder Singh 58) def: Ramakian 128 (Shayan Singh 4/27).